Peter Ydeen is primarily an Urban Landscape photographer currently living in Easton Pennsylvania, working in New York City and often traveling abroad. He works within the now established tenet of Urban Landscape Photography, which celebrates the complexity and beauty of the mundane world. As the work progresses it has been taking on a more romantic quality, which uses the typical and ordinary as an impetus, but then adapting more ethereal qualities. His work looks for inspiration in the poetics of George Tice, the playful lyricism of Paul Klee, the eccentric energy or Charles Burchfield, all trying to set themselves within the romantic setting of an E.T.A. Hoffman tale. Peter Ydeen studied painting and sculpture at Virginia Tech, under Ray Kass, (BA), Brooklyn College under Alan D’Arcangelo and Robert Henry, (MFA Fellowship) and at Skowhegan School of Painting and Sculpture with visiting artists, Francesco Clemente, Judy Pfaff, William Wegman, Mark Di Suvero and others. After studies, Peter made his way in a variety of jobs, including set construction, lighting, illustrations, architectural modeling working in architecture, stage, advertising and film. Later, after marrying his wife Mei li, they opened a gallery in New York City selling African, Chinese and Tibetan sculpture. Over the last several years Peter has concentrated on photography where he is able to use these many years spent learning to see. 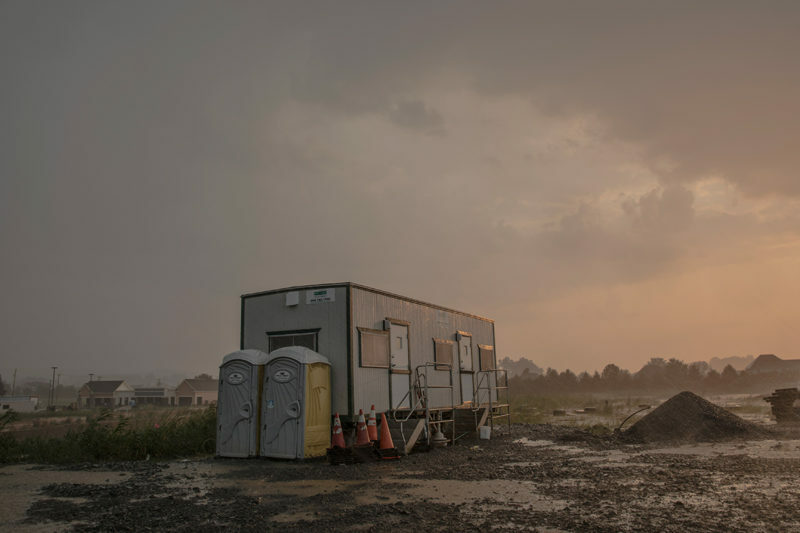 In “Valley Days”, photographer Peter Ydeen, is creating a series of Urban Landscape images which find their roots in the work of photographers such as William Eggleston and George Tice. Whereas Eggleston photographed “the ugly” and Tice then took that subject towards his own poet sensibility, they both celebrated the mundane. Ydeen’s photos take these tenets, and create a mixture of minimalism and animism which use limited palettes to venture into a Romantic vision. Although based on this terse structure and composition, it is then often laid over with playful, lyrical and chimerical overtones. They are celebrations taking our engineered worlds; the stages where we act, isolates and emphasizes them, then continues on to embelish. Without people, they are all about people, revealing an optimistic world we have formed, which are then presented with unique insight. They do not fall into what we normally think of as photography, but are developed in an almost painterly fashion. Each image becomes less the moment or the capture, but instead an overture towards a surreal timelessness of our manmade environment. The photographs in “Valley Days” were taken in the Lehigh Valley of Pennsylvania. With almost a million people, and encompassing several cities, it has a settled history, which grew hand in hand with that of the United States, and thus provides a variety of environments typical of much of America.